You just got a brand new fresh pair of trekking poles. They look great, but how do you use them? Proper adjustments, maintenance, and correct use are all key to get the most out of these trekking poles. Get comfortable with the locking mechanisms on your poles so you feel comfortable re-adjusting on the trail. With external locks you usually can adjust the tension of the locking mechanism by turning the adjustment screw a fraction of a turn. Take a moment to get comfortable with your trekking poles by reading the instruction manual provided by the manufacturer. Your trekking poles appear to be relatively simple pieces of gear but reading the directions now can prevent a screw up later. Trekking poles are adjustable to accommodate hikers of different heights, participating in different activities, on different terrain. Adjusting the poles is easy, but you’ll want to determine which length is most comfortable. When adjusting pole length, aim for a 90-degree bend of the arm, then adjust for comfort. Many hikers like to make poles slightly longer for a steep downhill and slightly shorter for a steep uphill. We’ve even heard of hikers adjusting poles to different lengths for a long traverse where one side of the trail is lower than the other. 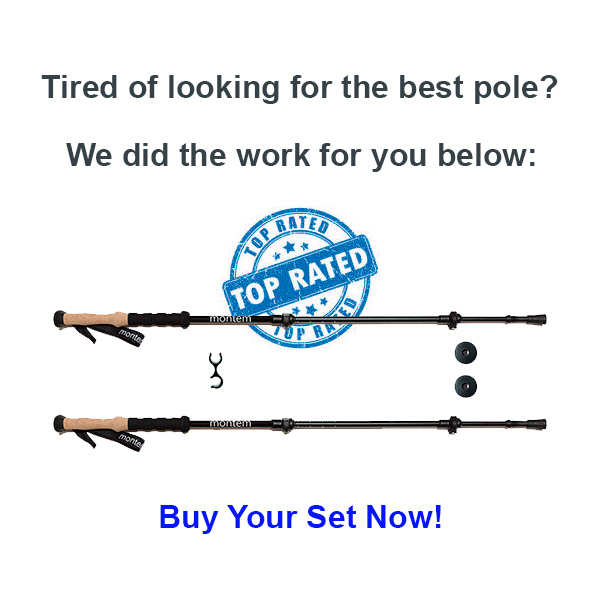 Most three-section poles require you to adjust both the lower and the middle shaft sections to marked lengths. In this case, loosen the locks and adjust both sections to the desired total length. Lock each segment securely. Holding the grip of the pole, your elbow should be bent at approximately a 90-degree angle and your forearm perpendicular to the ground. Once it’s comfortable, take note of the numbers written on the side of the pole. Knowing them will allow you to quickly adjust the second pole to the same length. A few poles are designed to have their lower section extended to the maximum length first. In this case, extend the bottom segment to its maximum extension, almost until the point where the shaft is marked “stop” (if you extend the pole beyond this point the locking mechanism won’t work and the pole could collapse). Use the pole’s locking mechanism to tighten the bottom segment firmly. Next, holding the grip of the pole, use the middle segment to lengthen the pole until your elbow bends at a 90-degree angle. Fine tune as needed. Put your hand through the appropriate strap from the bottom so it rests snugly around your wrist. Putting your hand through the top will not provide the necessary support. Grasp the grip and top of the strap with your hand. Tighten or loosen the strap as needed. Too loose straps are a common mistake. A properly adjusted strap is tight enough to help support the weight of your hand on the pole, but not so tight that it’s difficult to remove or restricts circulation to the hand. Get Familiar. 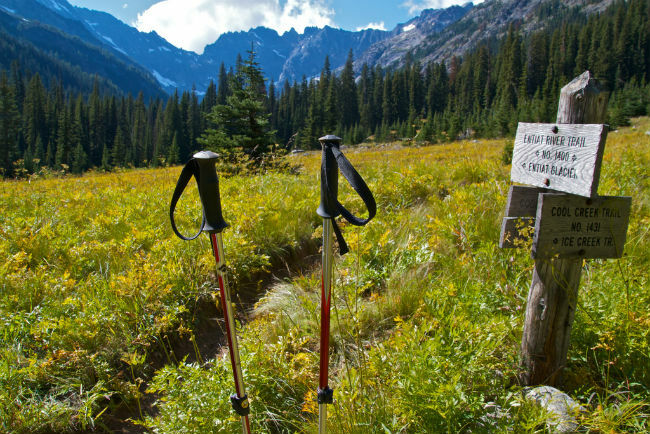 With occasional maintenance, trekking poles should last a long time. Disassemble the poles when you don’t have any hikes planned and have a few hours to spare. Look at the locking mechanisms, the tips, and the straps. Getting familiar with the inner workings of the poles will help you maintain and repair them. Repair and Replace. On aluminum poles, slight bends can be bent back by hand unless they no longer slide well in the other shafts. Several trekking pole manufacturers and their dealers sell spare parts like replacement baskets (in a variety of sizes and styles), replaceable tips, shafts, and expansion locks for their trekking poles. 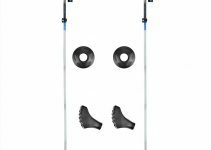 Check that the replacement parts work with the brand and model year of trekking poles you have before purchasing. Clean and Dry. Fisher and Brown both recommend that after getting poles wet or dirty, hikers disassemble them, pulling the shafts apart. Then wash them under water, wipe them off with a clean cloth, and let them air dry before re-assembly. Storing poles wet encourages oxidation, which makes poles harder to adjust and more subject to slipping. Have your own trekking pole tips? Share them here.